Sigmet RVP series hardware and IRIS software products. PC/Linux platform. It is the first commercial weather radar processor to offer open API’s that allow programmers to plug in their own algorithms that are written using standard DNU tools. 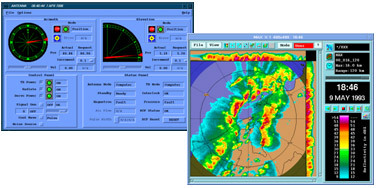 IRIS is a comprehensive suite of software tools for configuring, calibrating, generating products and operating a complete weather radar system. IRIS is a multi-platform product and is available on SGI, HP and Linux/PC platforms.